On one night this week, the Marshall Recreation Center hosted a student night full of prizes and activities. Another night, the Rec hosted a pizza night, which was open to all members. What these events had in common was that they celebrated a milestone in the history of the Marshall Recreation Center: it’s 10-year anniversary. 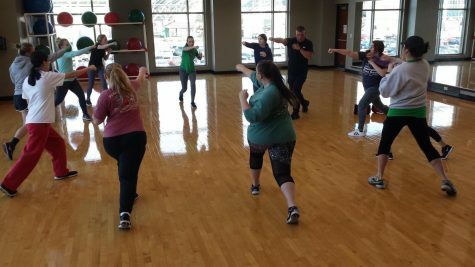 “The Marshall Recreation Center has become a staple not only to the Marshall University Campus, but to the Marshall Community as a whole,” said Bob Holub, Marshall’s director of campus recreation. Holub said he is proud to be a part of the 10-year milestone with the department of campus recreation at Marshall. Chris Trimble, an employee of the Rec, said that being a part of the 10-year celebration has meant a lot to him. “The Rec has made so many lifelong friendships, so it’s nice to know I’ve been a part of something like that,” Trimble said. Holub said the Rec staff is committed to being the best and bringing the best to those who use the facility and its programs. On Friday, lunch was served from 12 to 1 p.m. to close out a week of festivities celebrating the 10-year anniversary of the Marshall Recreation Center.